Let me thank you for your recent statement that made clear your support for the gamelan. I was pleased to hear that the ensemble will remain a part of the academic and performance schedules at the university for the next academic year. In your “greetings” on the school’s website, you suggest that Michigan is a place where students (and audiences) will have “unparalleled opportunities to intersect with the whole world of the arts.” The gamelan has been a primary vehicle for such artistic intersections as well as global arts opportunities on the Michigan campus for nearly 50 years, and I presume that it is one of the many paths that you see converging at this “intersection” of the world of the arts. . . .
[Unfortunately] your actions and those of the school over the years throw into doubt the school’s long-term commitments to the gamelan. During my time as a student, the gamelan faced previous semesters when the instruments were placed in temporary storage with no clear strategic plans for the ensemble’s future. As a GSI, I was directly involved in responding to these situations. (The past few years, which have witnessed the instruments being moved out of their permanent rehearsal room at various times, confirm that you either do not understand the importance of or do not value a permanent space for the ensemble. In contrast, ensembles at UCLA, UT–Austin, and Wesleyan have dedicated spaces.) Moreover, your failure to appoint a full-time, tenured faculty member who will shepherd, if not teach, the ensemble, shows a true disregard for the importance of the gamelan to the school and the university. To indicate that the gamelan ensemble is a serious priority, you need to make a clear commitment to a permanent space and provide clear faculty support through a full-time faculty member of the school for the UM Javanese gamelan. Without those clear steps, the school’s commitment to the ensemble remains doubtful. My full letter is online at http://goo.gl/4rMaef. Even though a month has passed since the announcement, it is still important to let the school know about your concerns. If you support the continuation of gamelan in any form at the university, make sure that you show your support by getting in touch with the school administrators. Share your concerns with the hashtag campaign. Thanks to the generous and passionate outpouring of support for the Javanese gamelan at the University of Michigan, the School of Music, Theater, and Dance has decided to maintain a graudate student who will provide teaching support to the ensemble in the next academic year! There has still not been a clear statement from the School on whether it truly supports this ensemble, emblematic of international arts performance and cultural exchange, over the long term. The Dean issued a statement that has not addressed the question of the ensemble’s long-term future. The statement also offers an ambiguous (though presumably critical) response to the article that appeared in the campus newspaper. It seems clear that the only way to secure a permanent space and teaching plan for the gamelan at Michigan will be for as many people as possible to contact the Dean directly to voice their perspectives and provide advice on this situation. Also let other administrators and decision-makers (e.g., faculty) at the University know of your concerns. You can make a public comment on Facebook at the SoMTD’s post regarding the Dean’s statement at https://www.facebook.com/umichsmtd/posts/10151991335763253. If you voice your concerns on social media like Facebook and Twitter, use the #saveUMgamelan hashtag! You can still sign the petition! If you haven’t been following the story to this point, check out my earlier post, which chronicles the petition: Save the UM Gamelan. This post was updated! Please leave a comment on Facebook! If this post motivates you to do one thing, let it be to sign the petition! The University of Michigan gamelan faces an uncertain future, despite its nearly 50-year history of vibrant educational opportunities and performances with many world-renowned artists. While the School of Music, Theater & Dance has just broke ground for a new addition, it can’t seem to find a place in its priorities (nor its facilities) for a permanent commitment to this venerable ensemble! The Michigan Daily has chimed in with this feature story, which offers a good overview of the history of the ensemble, how it arrived in Ann Arbor, and it’s history at the University. Current concerned students have created a petition to gather signatures. If you’re reading this, you can voice your support and sign it, too! And of course, go to the concert on February 15, 2014 at Stamps Auditorium to show your support! You can also contact university administrators directly, including the dean of the School of Music, the Provost, and the University President. And of course, go to the concert on February 15, 2014 at Stamps Auditorium to show your support! Save the UMich Gamelan http://t.co/U6LUEIrIXc #saveUMgamelan a little scrapbook of buzz so far, 48 hrs in! Update: nearing 2,000 signatures on the petition, in 48 hours. Nearly 2,000 signatures in 2 days! University of Michigan students play on the Javanese gamelan ensemble next to the pond near the Moore Building. “It’s now taken for granted that the things we do online are reflections of who we are or announcements of who we wish to be.” Yet, “what we do online still feels somehow novel and ephemeral, although it really shouldn’t anymore” (writes Rob Walker in the NYTimes). 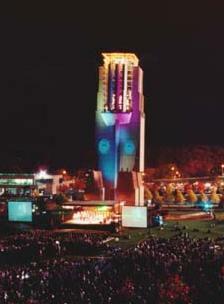 The Inauguration of the Lurie Carillon on North Campus (1998). Guests are welcome to watch the carillon being played, ring a few bells and enjoy refreshments. There are opportunities to take carillon lessons for credit starting in January, following a successful audition with University Carillonneur Steven Ball. Date: January 6, 2011, noon-6 p.m.
For more information: http://ur.umich.edu/events/events.php?se=23194. Image source: http://me.engin.umich.edu/news/pubs/grad/1997-1998/rodrigo/pg12/pg12.html. The Carillon page (currently inactive, but hopefully back someday! ): http://www.engin.umich.edu/about/lurietower.html. I recently caught a profile of the duo Būke and Gāss on NPR. There are many wonderful new groups and recordings out there, but this one caught my ear because of the emphasis on handcrafted, fusion instruments that are the duo’s hallmark. Their name, in fact, is based on hybrid instrument names! Hence the group’s name. 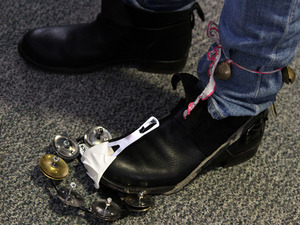 They also include other homegrown originals, such as the “toe-bourine” (at right). The style is also a bit eclectic, described on WNYC’s Soundcheck as “ornate distorto-twang.” They hail from Brooklyn and, to hazard a guess, fit into the urban hillbilly mode (or perhaps what Eric Cook calls home mode production). The full NPR profile from 27 December 2010 is available here, and it includes the sound file from the interview. Listen to and watch a video of the duo in the NPR Tiny Desk Concert here. You can listen to the full Soundcheck piece here, or check out the WNYC Culture blog’s review of the duo’s debut album Riposte.